Before we get to the activities, I want to make one thing clear: my kid has toys. He loves his little red wagon. There is a stuffed cat that he carries around like a baby. He's got a puzzle bench that he will spend chunks of time on. I'm not saying that toys are bad. I'm just saying toys aren't the only way to keep a toddler busy, and if you're trying to save money or cut back on consumerism and clutter, you don't need to feel pressured to fill your kid's toy box with conventional plastic junk. 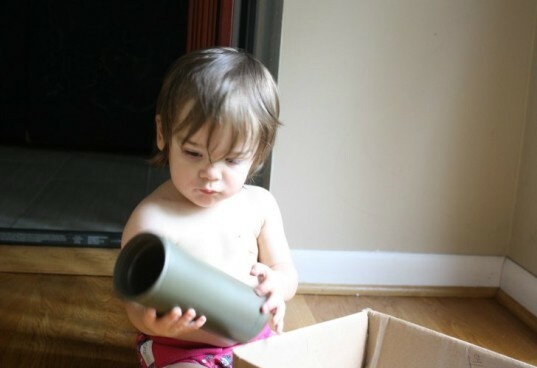 Read on for how to keep your tot busy, engaged and delighted using found items around your home. When it’s warm out, we do this one almost every day. I have a couple of large metal mixing bowls that I fill with water, and I give him measuring cups, washcloths, and clean paint brushes to splash with. He squeals when he sees the bowl! 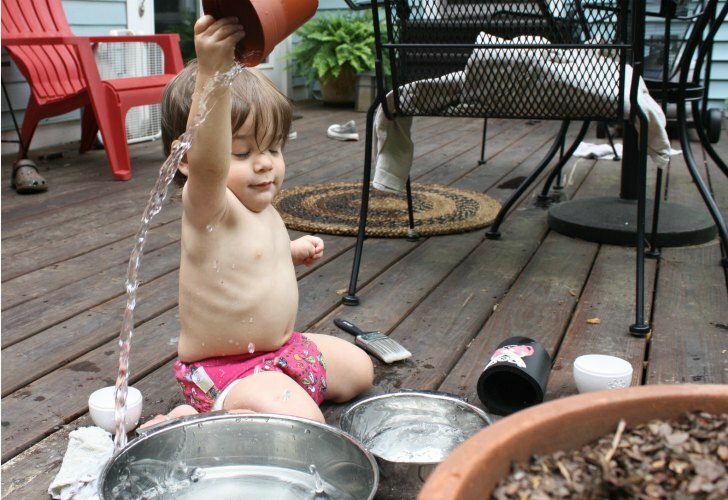 That same metal mixing bowl turned upside down goes from sensory play to an impromptu drum. Give that kid a wooden spoon or a stick to bang on it. We do this outside a lot once he’s splashed all of the water out of the bowl. I am sure that our next door neighbors are thrilled. I’m sorry, neighbors! I got this idea from the book Raising a Happy Unspoiled Child by Burton L. White. 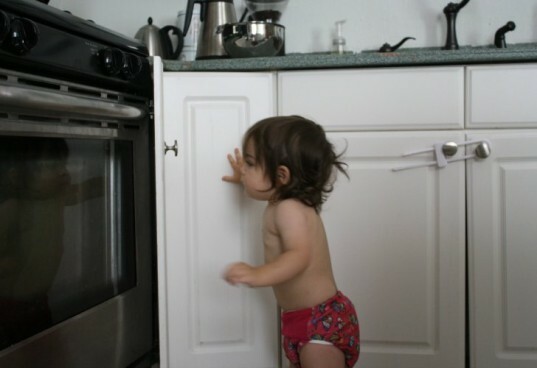 White suggests giving your toddler play areas in the kitchen, so that they can explore. 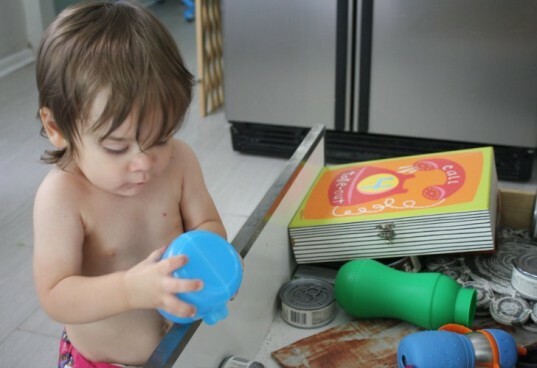 One of the areas that I babyproofed was a kitchen drawer. The drawer used to hold a mix of plastic and glass coffee cups, but now the glass ones are in a high cabinet and the drawer is just full of our reusable plastic coffee cups and plastic measuring cups. My son likes pretending to drink from them. He likes it even more if I put a little water in there, so he can spill it on himself and on the floor. It’s messy, but he’s happy, and I get time to cook a meal! This is another suggestion from Raising a Happy Unspoiled Child, and my son LOVES it. To babyproof a cabinet, I moved our ceramic and glass pans out and am only storing metal pots and pans and our wood cutting boards. This is the other weapon in my “I need to make supper” arsenal. My guy crawls in and out of there and plays with the baby-safe cookware inside. Sometimes he tries to close the door. It’s like a permanent fort! My toddler is obsessed with the straps on his booster seat, which blows my mind. Apparently this is a thing, because some other moms I’ve talked to say their kids are strap crazy, too. He will play on that chair for 10-15 minutes at a time, which means I can have a quiet cup of tea or even unload the dishwasher. Don’t have a booster seat? No problem! This activity is really my kid trying to figure out how to do something he sees me do many times a day: snap him into his chair to eat. As you go through your day with your toddler, see what little things like this interest him, then let him try himself while you get a few minutes of precious you time. I’m sure most parents have experienced this: you come home with a brand new, shiny toy, and your kid only wants to play with the box. Instead of letting that frustrate you, think of it as a free bonus toy! My toddler likes to crawl in and out of a larger box. He also likes when I fill up a small box with treasures for him to discover. He pulls everything out so methodically, then waits for me to put it all back in, so he can do it again. And again. Toddler obstacle course! Toss pillows all over the floor, and watch your toddler toddle from one to the next. I also stack large floor pillows near things that he’s too short to climb on. He is so proud when he climbs up onto the daybed in my office! Stacked pillows are also a great way to let your toddler practice climbing if you don’t have stairs. If you have large floor pillows, stack a couple of them up, and you can encourage your kiddo to climb down backwards instead of face first. He learns safety and has a great time! A little flour on his high chair tray is a fun sensory activity on a rainy or way too hot day. Just snap your kiddo in, pour out a bit of flour, and let him go to town. I will not pretend that this is a neat and tidy activity, but that’s part of what makes it so much fun! If you’re trying to avoid wheat, you can do this same activity with any small grain. I’ve used cornmeal and chickpea flour, and he enjoys both of those just as well. Your toddler is absolutely going to taste this stuff, so keep any food sensitivities in mind when you’re choosing your sensory material. Do your windows have curtains? They’re not really curtains: they’re a peek-a-boo game! My toddler loves to hide behind curtains, then peek out. He initiates this game with me now, and we take turns hiding and popping out at each other, to his endless delight. I have even caught him trying to play this game with the cats, which beats his usual awkward interactions with them for sure. Some of the activities above are for independent play, and there are some where you can play with your toddler. But there are a lot of interactive games that don’t require anything but you, your kid, and some imagination. My son’s current favorite game is to grab my hands and clap them for me. I make an exploding sound when he claps my hands together, and he laughs his little face off. He also loves hanging upside down in my arms, making faces, and making funny noises back and forth. 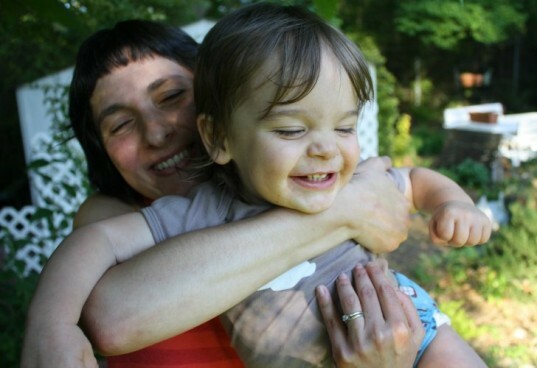 If you’ve got lots of energy, put on some jams and have a toddler dance party! There are few things cuter than watching your one- or two-year-old shake his booty. When it's warm out, we do this one almost every day. I have a couple of large metal mixing bowls that I fill with water, and I give him measuring cups, washcloths, and clean paint brushes to splash with. He squeals when he sees the bowl! 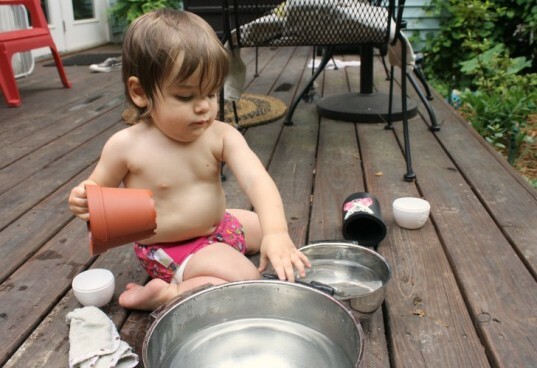 That same metal mixing bowl turned upside down goes from sensory play to an impromptu drum. Give that kid a wooden spoon or a stick to bang on it. We do this outside a lot once he's splashed all of the water out of the bowl. I am sure that our next door neighbors are thrilled. I'm sorry, neighbors! The drawer used to hold a mix of plastic and glass coffee cups, but now the glass ones are in a high cabinet and the drawer is just full of our reusable plastic coffee cups and plastic measuring cups. My son likes pretending to drink from them. He likes it even more if I put a little water in there, so he can spill it on himself and on the floor. It's messy, but he's happy, and I get time to cook a meal! This is another suggestion from Raising a Happy Unspoiled Child, and my son LOVES it. To babyproof a cabinet, I moved our ceramic and glass pans out and am only storing metal pots and pans and our wood cutting boards. This is the other weapon in my "I need to make supper" arsenal. My guy crawls in and out of there and plays with the baby-safe cookware inside. Sometimes he tries to close the door. It's like a permanent fort! My toddler is obsessed with the straps on his booster seat, which blows my mind. Apparently this is a thing, because some other moms I've talked to say their kids are strap crazy, too. He will play on that chair for 10-15 minutes at a time, which means I can have a quiet cup of tea or even unload the dishwasher. Don't have a booster seat? No problem! This activity is really my kid trying to figure out how to do something he sees me do many times a day: snap him into his chair to eat. As you go through your day with your toddler, see what little things like this interest him, then let him try himself while you get a few minutes of precious you time. I'm sure most parents have experienced this: you come home with a brand new, shiny toy, and your kid only wants to play with the box. Instead of letting that frustrate you, think of it as a free bonus toy! My toddler likes to crawl in and out of a larger box. He also likes when I fill up a small box with treasures for him to discover. He pulls everything out so methodically, then waits for me to put it all back in, so he can do it again. And again. Toddler obstacle course! Toss pillows all over the floor, and watch your toddler toddle from one to the next. I also stack large floor pillows near things that he's too short to climb on. He is so proud when he climbs up onto the daybed in my office! Stacked pillows are also a great way to let your toddler practice climbing if you don't have stairs. If you have large floor pillows, stack a couple of them up, and you can encourage your kiddo to climb down backwards instead of face first. He learns safety and has a great time! 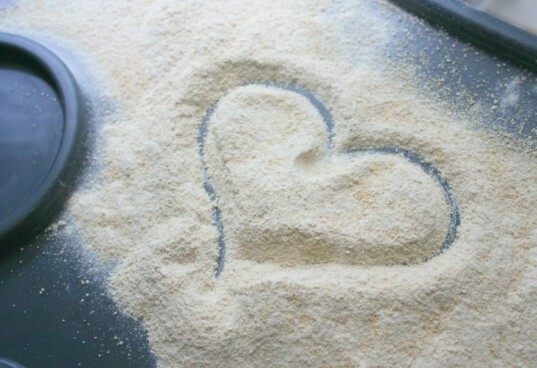 A little flour on his high chair tray is a fun sensory activity on a rainy or way too hot day. Just snap your kiddo in, pour out a bit of flour, and let him go to town. I will not pretend that this is a neat and tidy activity, but that's part of what makes it so much fun! If you're trying to avoid wheat, you can do this same activity with any small grain. I've used cornmeal and chickpea flour, and he enjoys both of those just as well. Your toddler is absolutely going to taste this stuff, so keep any food sensitivities in mind when you're choosing your sensory material. Do your windows have curtains? They're not really curtains: they're a peek-a-boo game! Some of the activities above are for independent play, and there are some where you can play with your toddler. But there are a lot of interactive games that don't require anything but you, your kid, and some imagination. My son's current favorite game is to grab my hands and clap them for me. I make an exploding sound when he claps my hands together, and he laughs his little face off. He also loves hanging upside down in my arms, making faces, and making funny noises back and forth. If you've got lots of energy, put on some jams and have a toddler dance party! There are few things cuter than watching your one- or two-year-old shake his booty.